And How Much Does *Your* Dad Love You? 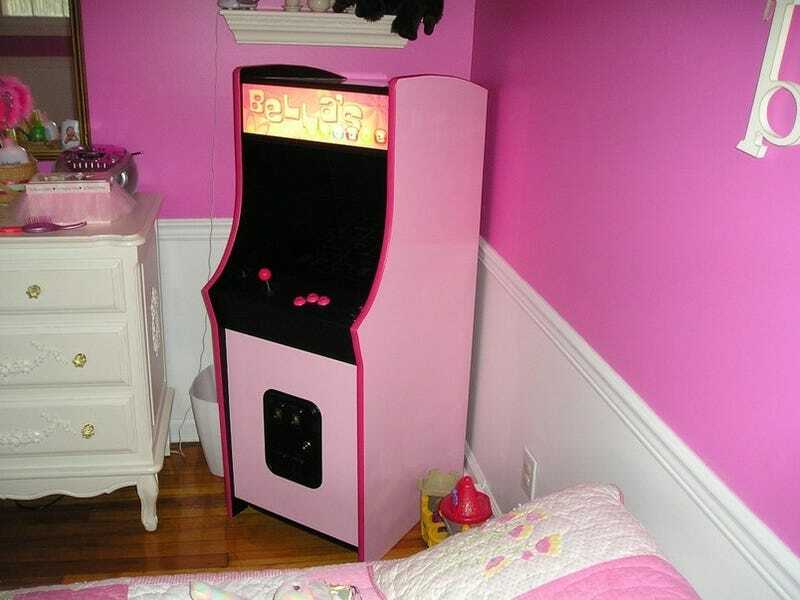 About two years ago, a proud father began work on a custom pink arcade cabinet for his then 2-year-old daughter. Well, now she's four, and he just moved it into her room. Welcome to "Bella's Arcade," built by James, who has built and restored other arcade cabinets. This cabinet is built 80 percent to scale, so little ones can play it standing straight up, while adults would have to sit down to see the screen fully. He put in a Windows 98 machine that boots up to a MAME custom skinned with the Bella's Arcade theme. Players can choose from 250 arcade classics. For me, the best feature about this is the coin box. Instead of crediting your game with a button on the dash, you press the coin slot - or you can insert a coin. And why not, this is the age when kids get piggy banks, too. Good work, daddy! Someone got a huge, huge neckhug when this rolled in.